CyberTelecom Blog: In Which a Building is Built, and a Domain Name Registered: Cleary Building Corp, V. David A. Dame, Inc. In Which a Building is Built, and a Domain Name Registered: Cleary Building Corp, V. David A. Dame, Inc.
Today’s case involves the classic alleged scenario of a gripe site which used a Plaintiff’s trademark in Defendant’s web site domain name - and whether this might be a violation of the Anti Cybersquatting Consumer Protection Act (ACPA). Cleary Building Corp, V. David A. Dame, Inc., Civil Action No. 09-cv-01578-CMA-MEH. (DCo Dec. 1, 2009). But first, a visit to the Wayback Machine, back, oh, let’s say 15 years. The 1990s saw a domain name land grab. With only a few top level domains such as DOT COM in which to register web sites, it became a gold mine for first movers to toss a couple of pesos speculating on any domain name they might think of – warehousing them for a while – and then attempting to extort some late-to-the game company. Cybersquatters were warehousing 1000s of domain names and making fortunes off of a few exclusive lines of code in a data base. In that cyber libertarian era, Congress did not pass a lot of Internet related laws (or any other laws) – however they thought they ought to squat on cybersquatters – and passed the AntiCybersquatting Consumer Protect Act. Speculating on domain names - - - bad. Which leads us to today’s case. This case involves a dispute with a contractor (did I just hear a series of groans-of-empathy from the audience). Defendant allegedly hired Plaintiff to build a building. A dispute arose about the construction. A list of issues to be addressed was created. A second list of issues to be addressed was created. Ultimately defendant refused to permit Plaintiff access to the site in order to complete the work. After this came a domain name registration and a website. Defendant put the building up for sale and created the website "my[plaintiff]building.com," presenting information about the building (the website was blank when we checked it). Plaintiff alleged ten complaints in total against defendant, and there are more facts to the disputes, but these are the facts relevant to the ACPA claim. the domain name and the trademark are either identical or confusingly similar (or dilutive for famous trademarks). This case turns on bad faith. It was conceded that the mark was famous, and the court found it was "plausible" that Plaintiff’s trademark and Defendant’s domain name were confusingly similar (the court will later confusingly take this back). The bad faith element is the key. Normally, cybersquatters register many domains and then try to sell them. But in this case, Defendant was not warehousing and speculating on domain names; there’s just one domain name in question. Defendant did not offer to sell the domain name; Defendant used the domain name to gripe about the Plaintiff. So how does Plaintiff try to get around that? Plaintiff alleges that Defendant tried to use the domain name to gain an advantage in negotiations with Plaintiff. "These factors are designed to balance the property interests of trademark owners with the legitimate interests of Internet users and others who seek to make lawful uses of others' marks, including for purposes such as comparative advertising, comment, criticism, parody, news reporting, fair use, etc." H.R.Rep. No. 106-412, at 10 (1999) (Conf.Rep.). In other words, Congress recognized the democratic necessity and value of griping! The courts have affirmed the value of griping. The Court did not review the nine factors, item for item. Instead, the Court concluded that Defendant was all about informing "fellow consumers about his experiences with the Plaintiff's company, which he believed performed inferior work." "The exhibits to the Complaint show that the DEFENDANT Website is nothing more than a ‘gripe site.’ The Defendant is using the site to tell his story and make his complaints and grievances with Plaintiff known." The Court rejected Plaintiff’s argument that Defendant sought to use the website in order to gain an advantage in negotiations – and that this constituted bad faith. The Court also was not persuaded that Defendant’s Site was confusingly similar to Plaintiff's trademark. Defendant’s site is entitled "My New Building By Plaintiff" and "contains information about Defendant's experiences with Plaintiff regarding the DEFENDANT Building." The Court concluded, "it is simply not reasonable to conclude that someone viewing this website would be confused as to the source, sponsorship, affiliation, or endorsement of this site." It's clear that this court was not going to let the ACPA be used as a weapon to censor consumer discourse concerning (dis)satisfaction with vendor goods or services. Consumer feedback on the Internet, including griping, ratings, reputations, have empowered consumers with information enabling them to make more informed purchases. 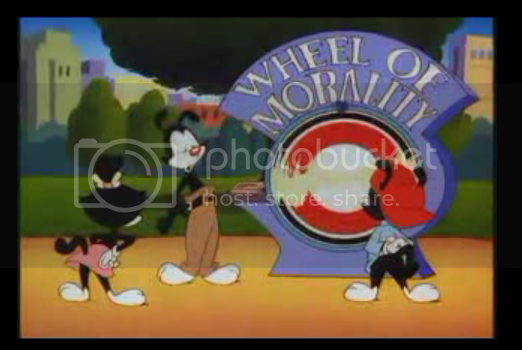 Let’s spin the Wheel of Morality and learn the lesson of today’s post! "Wheel of Morality, turn, turn, turn - Tell us what lesson we should learn." [Whirl, Click, Click, Clock]. "You have to Fight! For Your Right! To Whine and Gripe!" (Can you believe the Beastie Boys are in their 40s! ).